Private Investigator Helen Walsh's life is coming apart at the seams; her cases are non-existent, her mortgage payments are in arrears and she can feel herself slipping into depression. She's moved out of the flat she loves and back into the family home and then, as though her situation isn't bad enough, Helen's ex shows up. Helen hasn't seen Jay Parker since they broke up a year ago but he's back with an urgent case for Helen to solve. As manager of 90s boyband Laddz, Jay Parker is responsible for putting together their reunion gigs. But days before their first scheduled concert, Wayne Diffney, the 'wacky one' within the band, vanishes without a trace. Helen doesn't want to have anything to do with Jay Parker but with her money woes, she is forced to take on the case. 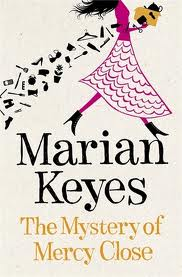 The Mystery of Mercy Close, like Marian Keyes' previous novels, is a fun and humorous book with a serious storyline woven through it. Helen has suffered from depression in the past so she's aware of the signs and feels herself slipping away, losing herself to the illness. She throws herself into the missing person's case as a distraction, focusing on Wayne and his mysterious whereabouts instead of succumbing to her dark thoughts. Helen is the youngest of the Walsh family and it was great to be reacquainted with them. Helen is a strong, fearless character who doesn't take any nonsense but she also has a vulnerable side as depression begins to take hold. I loved Helen - particularly her shovel list - as she is such an amusing character but I worried about her as the days passed and her mental health suffered. I wanted somebody to reach out to her and help her through it. She is, as are the rest of the Walsh family. Thanks for letting us know about this book, I hadn't heard of it before. You're welcome. I love anything Marian Keyes.